First of all, my skin is very oily and spot prone. My skin was recovering well using my usual skin routine. I do recommend the Garnier Pure Active Purifying 24 Hours Moisturiser. Hydrates my skin, mattifies for several hours and helps fight spots. Oily skin needs to be moisturised too. But one time around November/December, my skin became dry. Not oily, very dry, chapped, flaking, near enough eczema like skin. Also had whiteheads forming. Felt tight and stung. Skin nightmares. The Garnier moisturiser wasn’t moisturising and effective enough to fight the eczema. This was the second time my skin did this. Happened around the same time last year. 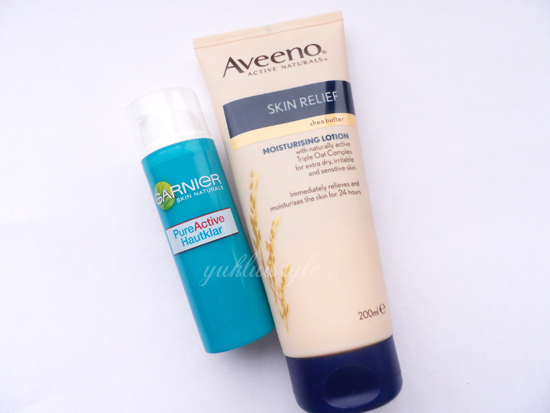 My brother and little cousin uses this Aveeno Skin Relief Moisturising Lotion on their eczema (face and body) and have seen dramatic results so decided to try it out. This lotion is mainly a body lotion but it is effective on the face. Washed my face gently every few days then I had used this every morning and night before bed for 2 weeks straight. My skin had gotten a lot better. I did break out more as well but I had to combat one problem at a time since spot combating products are way too harsh. Eczema skin was the top priority. After the 2 and a half weeks, I am able to go back to my normal skin routine to combat my next problem, oil and spots. The moral of this is that even the oiliest skin can become dry all of a sudden. Got to be ready to adapt to new routines until it’s fully better. And to combat one problem at a time rather than all at once and never get any results. actually, the only thing I allways forget to use is a moisturiser…Shame on me I guess! Also, have you even though that your skin might be dry instead of oily? For years I though I had oily skin and abused it with products for that skin type because my cheeks were so greasy! Then I read somewhere that some people with oily skin actually have dry skin and the reason why their face produces so much oil is because the skin is so dry! My skin is now in better condition since I've switch to products aimed for dry skin. Sorry for the mini essay but it's just a thought ^^"
You have brilliant Skin Care Products for healthy skin with outside effects. A wonderful story for Good skin care.